Reports are out claiming that Manchester United are believed to be pondering another move for Everton’s Marouane Fellaini. The Premier League champions were unsuccessful in their bid for Barcelona’s Cesc Fabregas and according to reports will again pursue the Toffees’ Belgian ace. 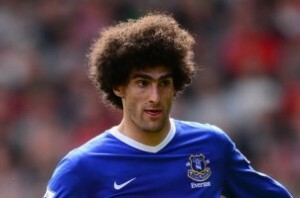 Fellaini will be the subject of a £23.5million bid from United as David Moyes seeks to bring in a quality midfielder ahead of the 2013/14 campaign.